This news is unlikely to shock anyone but I’m quite partial to social media. And I think it’s kind of neat that Facebook knows me so well that posts and pages for new Perth eateries seem to make it into my news feed. This is how I happened upon The Peasant’s Table in Mount Hawthorn. I’d noticed a few pics of their food which looked fabulous and I was keen to give them a whirl. However their Facebook page launched a good month or so out from opening day but as I learnt they were having a soft opening in the final few weeks of August before their official launch date of August 31. I’d tried to get a Sunday lunch booking when doors weren’t officially opened but their reservation book was already full on that particular day. More recently on a Saturday GG and I fancied heading out for a quick bite and The Peasant’s Table came to mind. We arrived around 11.45 and thankfully there was a table available for us. 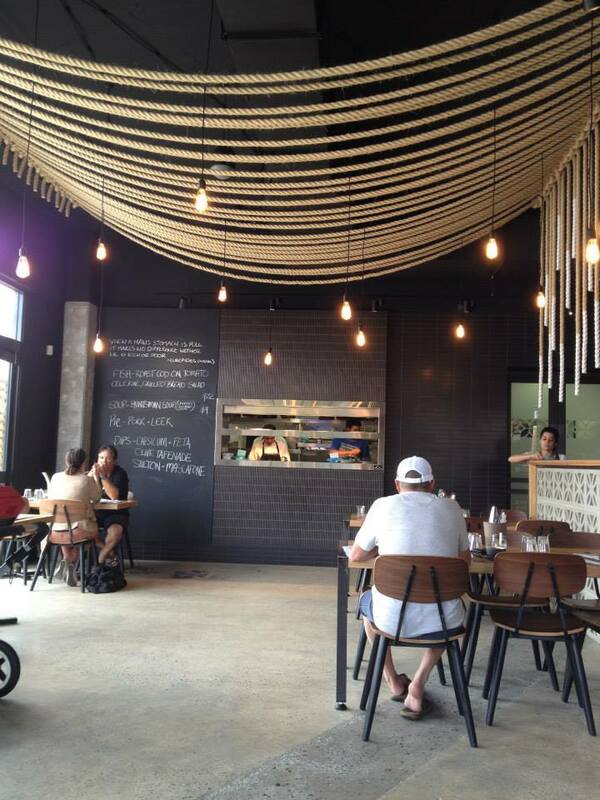 The Peasant’s Table is located within the Mezz Shopping Complex in Mt Hawthorn along Scarborough Beach Road. I’d actually never ventured inside the Mezz before. I’d driven past it on my way to the Paddo where we go to watch the UFC but today was the first time we actually went inside. Thankfully the restaurant wasn’t too tricky to find and it’s actually a much bigger venue than I had expected. You walk in and there is the front counter, an artful timber and tile display where drinks are prepared and then there is a dining area to the left and the right. tables. Almost made it feel a little sparse and they could perhaps sneak a few more in. I like the fit out though. Quite a modern feel to it I thought, almost in contrast to what the name suggests, with the polished concrete floors and dramatic rope display that loops across the roof and is interspersed with dangly filament lights. Those filament lights, I love them, but I think every new venue I’ve been to of late seems to have them! They are clearly the must have décor item of the last 12 months. 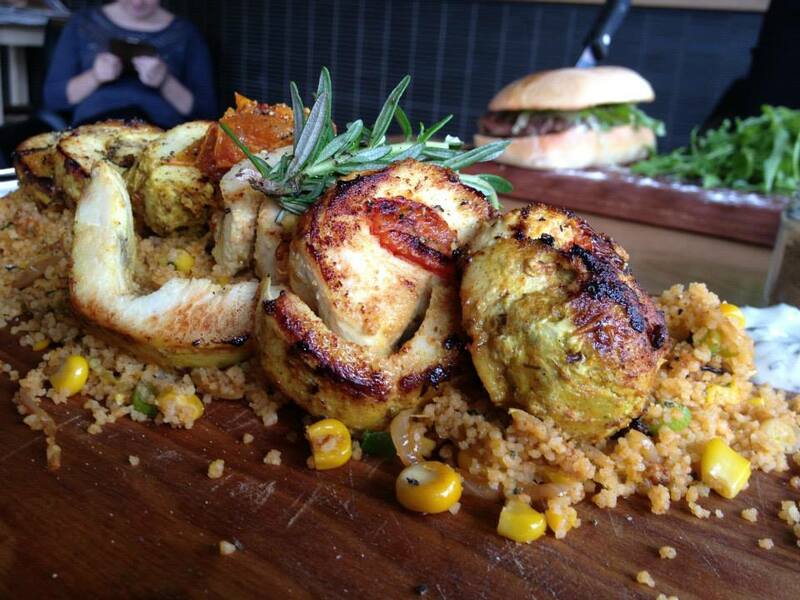 earthy tones further comforted by relaxing tunes and fresh ingredients cooking. We were brought glasses of water and clipboard menus, which was separated into smaller shared dishes on the front page and then larger mains on the second page. Feeling particularly peckish we decided we’d start with two of the Quarter Plank dishes – Salt and Pepper dusted calamari with smoked paprika aioli ($9.50) and Pork Belly, amazing three hour roasted belly, caramelised sweet apple puree with shaved fennel and chilli vinaigrette ($9). Now I knew that Head Chef Richard Mussell had previously worked at the Subi Hotel and the Subi’s pork belly is GG and my benchmark. So I was keen to see whether it was a similar recipe to what we’d tried there. 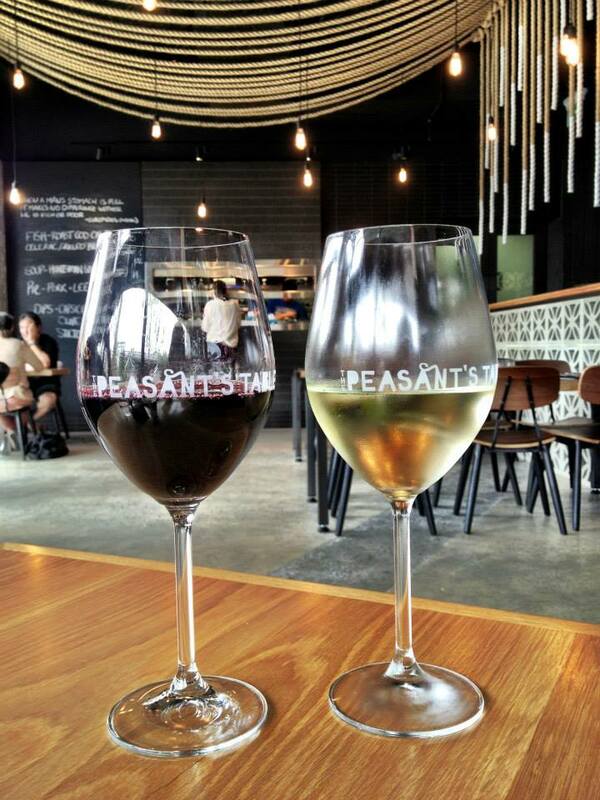 The food at The Peasant’s Table, is as the name suggests, simple, rustic, tasty and wholesome. Both dishes presented beautifully on their wooden planks. 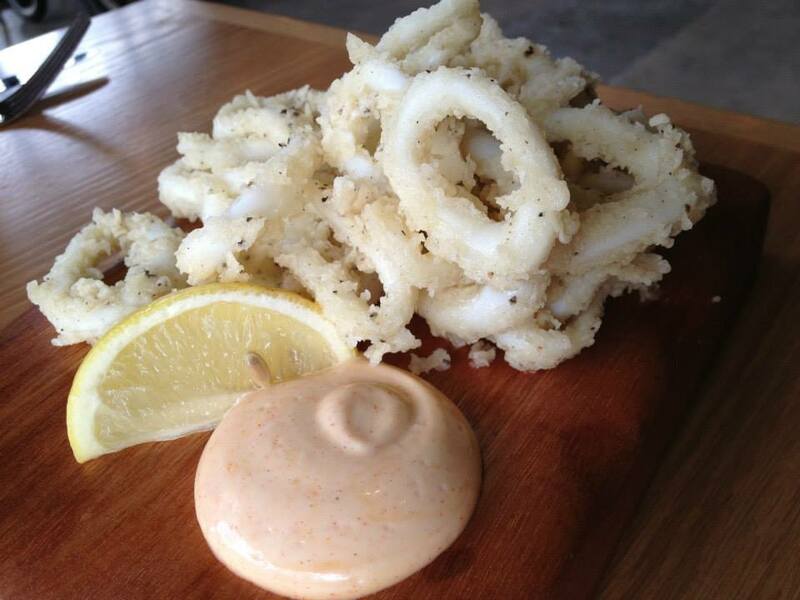 A decent stack of calamari was carefully balanced along with a generous dollop of aioli. The batter was slight and cripsy and the calamari was cooked to tender perfection. Nothing chewy about it at all! The smoked paprika aioli was pleasant albeit fairly mild and both GG and I had hoped that the overall flavour of the dish was a little more punchy. Whether they spiced up the batter or maybe just upped the paprika in the dipping sauce, we just felt it lacked a bit of kick. The pork belly looked amazing and had been lovingly slow cooked and its fatty goodness was rendered beautifully. I liked the addition of the sweet apple puree and the slight zing from the chilli vinaigrette. Plus I quite liked the slight crunch in the delicate fennel slices. It was good and the pork did just melt in your mouth, but it didn’t quite knock the Subi’s from its mantle of our number one Perth pork belly experience. Two dishes in and we had enjoyed them both but hadn’t quite had our socks blown off. So onwards and upwards to our mains. I’d ordered the Steak Sanga – of marinated beef rump sliced and topped with lashings of crushed potato salad, rocket, caramelised onions in a ciabatta loaf ($20) and GG the Moroccan Rolled Chicken Breast served with corn and chilli cous cous and mint, lemon yoghurt ($28). Again, more planks. Some folks have issues with planks and the potential issue with keeping them clean. I don’t know if that aspect phases me too greatly but I’m just not sure that its necessary to serve every course on a plank. Nothing wrong with plates but planks and slate do seem to be all the rage. Anyways for the second time we were both taken with the presentation. Everything looked very appetising. GG’s chicken dish was a generous size, perfect for a growing lad. 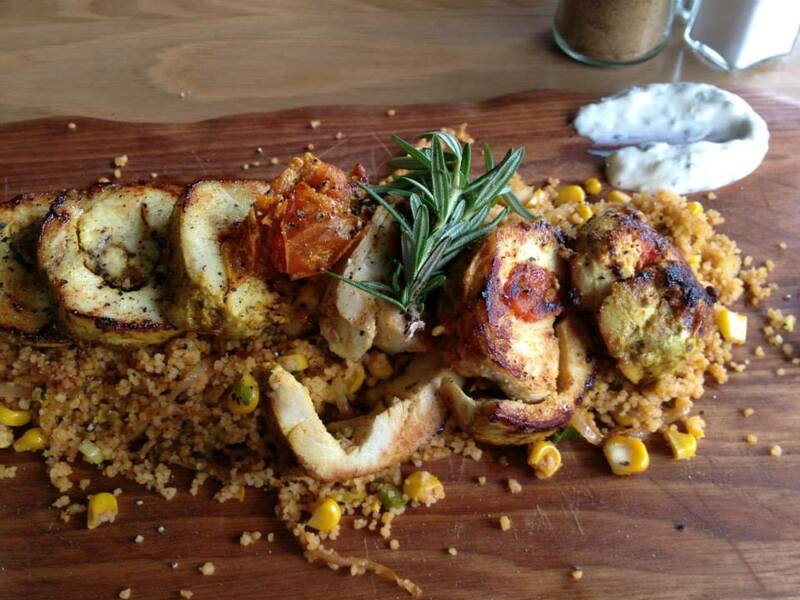 Plump chook pieces were artistically stacked on top of a mountain of cous cous, along with a few swirls of the creamy mint and lemon yoghurt. I tried a bite and it was a nice dish but again just seemed like it needed a little something extra to lift the flavours. 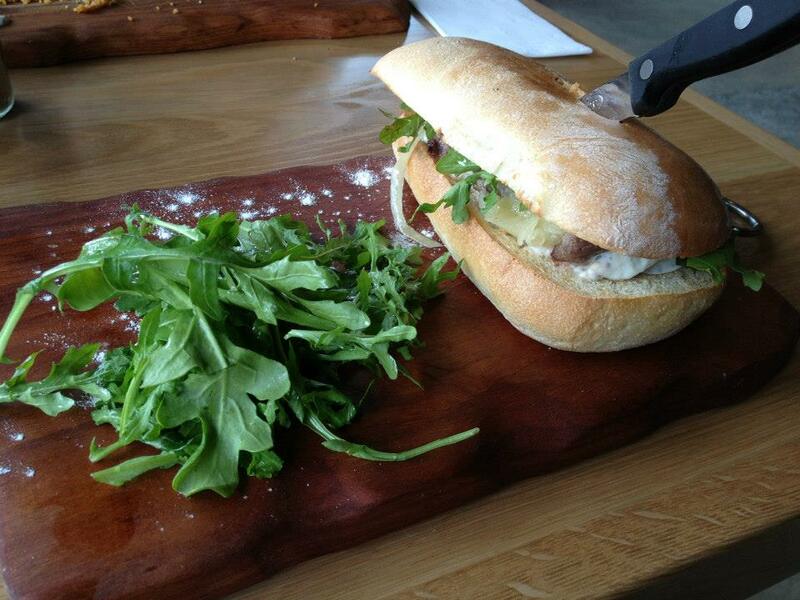 My steak sandwich presented well and I quite liked that they had spud salad as part of the filling. The potato salad was chunky and coated with a creamy seeded mustard dressing. Having it in the roll was something different to the usual chips that you see on the side of a steak sanga and an interesting combination along with the tender steak slices and peppery rocket. 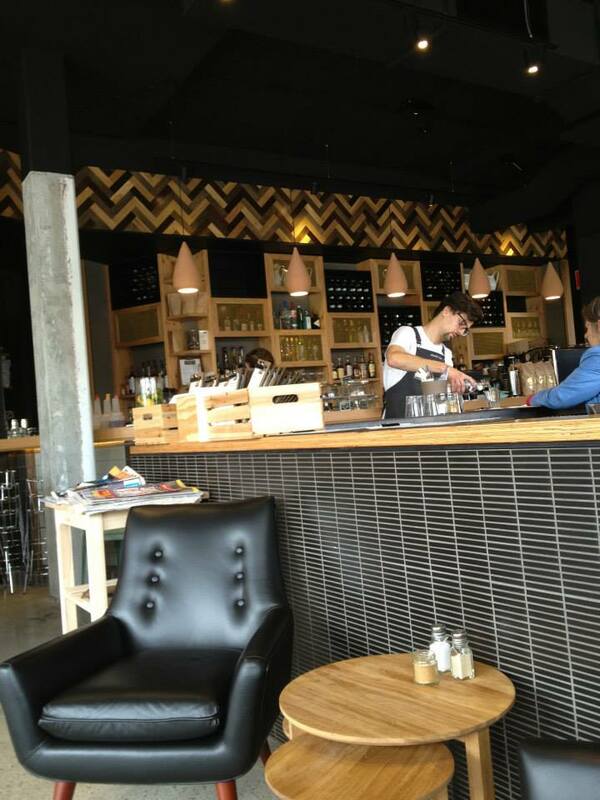 Bread at The Peasant’s Table is sourced from Vastese Bakery in Alma Road, North Perth. Somewhat of a Perth institution and in operation since 1957. They know their bread and it was a delicious roll. 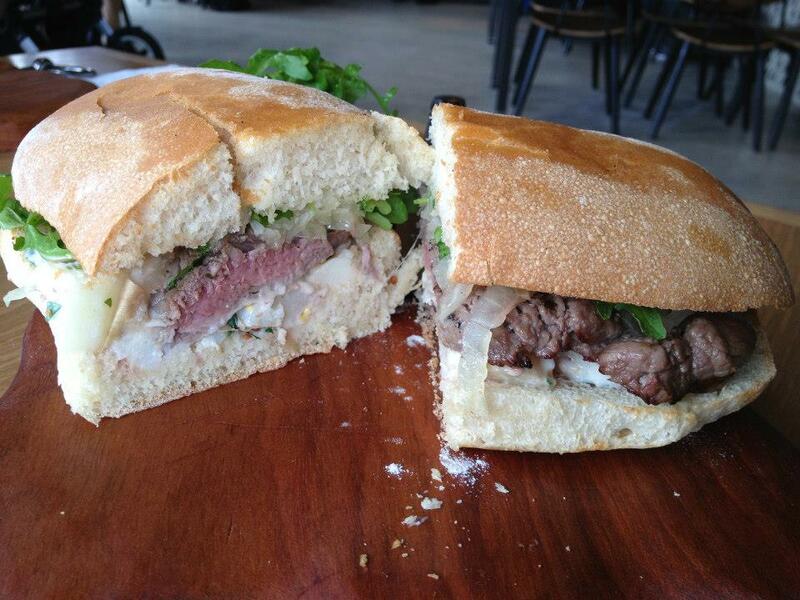 It was a tasty steak sandwich and incredibly filling. So there you go. Lunch was done. We thought having dessert at lunchtime would be slightly indulgent since we knew we were heading out to dinner that night and we were both feeling pretty comfortable after our shared starters and mains. Hmm…so thoughts. Well no faults on the service front, it had been friendly and efficient and presentation wise the food all looked really lovely and it was nice. I’ll admit I went in with pretty high expectations and I think I’d hyped this place up in my head before my visit after seeing all those Facebook pics in the lead up to opening day. It didn’t quite meet the lofty heights I had hoped it would. But I am reminded that they have been officially open only a few weeks now and they could well be still finding their feet, so I’m keen to head back later in the year to give it another whirl. Yum! I walked past there the other day and wondered what it was like!